It’s not that long ago, in the timeframe of human events, that we didn’t have electricity. Homes were heated with wood or coal, and our light came from oil lamps. Fast forward a hundred years to today, where electricity is called upon for every aspect of modern life. When the electric service fails in our home, the feeling of helplessness can set in within seconds. We can’t even “get back to nature” by camping in the wilderness without having some way to recharge our cell phones. Thus, the need for the best generator. On a bright, sunny day a backup power supply for emergency use may seem unnecessary. But when that winter storm tears down the power lines and electric service won’t be restored for days, the cost of a generator will seem like a very small price to pay. And that’s just one use. Portable generators are hard workers on construction sites. Almost every RV on the road carries one, and many small units go camping or deliver power at picnics and other events too far from the outlet for an extension cord. A portable generator has become almost as indispensable as that cell phone that gets plugged into it. To help you sort through the hundreds of options, Stuffoholics has investigated the market and come up with our Top 10 Best Generator list. There are so many styles, sizes, and capacities of generators on the market that sifting through them all is enough to drain you of your own power. But we’ve done the work for you. We have tested about 70 different brands in our search for the best generator and have narrowed it down to our top 10. We’ve been doing this with products for you for more than four years now. We have only one aim in doing this; We want to arm you with the best information and product knowledge possible so that you can make the right decision when buying a product like this. It’s your money and you should know that you are getting the best generator currently available on the market. We scoured the internet for more than 50 hours, reading reviews by real owners. We spent a week testing these generators through community-based usage. We tested each unit ourselves to make sure the data was accurate. We compiled the results and arrived at our best generator list. Stuffoholics does not promote any particular brand. We don’t even recommend a particular size or style of generator because the wide variety of uses for these machines means there is no one-size-fits-all answer. Our singular goal is to equip you with real data so that you can make an informed choice yourself. Based on the features and your wide range of demands for these systems, we have arrived at our list of top rated generator choices. In the simplest of terms, a generator is a machine that turns gas, diesel fuel, or sometimes natural gas into electricity. Of course, nothing is ever that simple. In reality, a generator is a complex system that begins with an engine which uses that fuel to create kinetic energy in the form of a spinning driveshaft. That energy is transferred to a unit that looks like an electric motor. This is, in fact, the one part of the overall machine that is accurately called the generator. Think of it as a reverse electric motor. Where an electric motor takes in electricity and turns it into that spinning kinetic energy, this unit does the exact opposite. It turns that rotating energy into electricity by spinning magnets past each other. The machine we call a generator usually comes with a lot of added features. Some have an inverter (more on that a bit later), automatic low oil shutoff, ultra-quiet mode, and even a remote start key fob. They can be of a lightweight design to be very portable, or they can be huge and capable of supplying electricity for a whole house or a construction site. 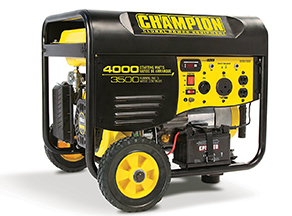 A wide array of engine sizes means these generators have an equally wide range of power capacities. What Are the Features You Need to Look for in the Best Generator? The primary focus when buying a generator should be the running wattage capacity. This is the measure of how much electrical energy the machine can deliver on a consistent basis. If you are only running the blender, a 10,000-watt system is a lot of overkill. An 1800-watt machine would do just fine for the blender, but don’t expect to plug in the refrigerator and microwave, too. 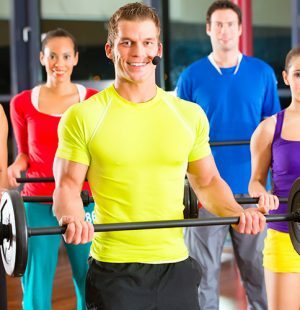 Our best advice is to figure out how much power you think you need, and then step up a bit from there for two reasons. First, you’re always going to find more things you want to power. Second, the generator is going to be working harder if you are using it to maximum capacity. A larger machine that isn’t working as hard will last a lot longer. Most generators are capable of delivering more power for shorter spike demands, but the running wattage is the maximum steady load you can expect the generator to bear. That number will be in close correlation with engine size because the higher your need for electricity, the more powerful the gas engine must be. A larger engine also needs more fuel, so the size of the gas tank is also a factor. Half load time is a good comparison method. This is the measure of how long a generator can run at half of its wattage capacity on a full tank of fuel. A top-rated generator should be capable of running for at least 8 hours. The starting method can be a prime consideration, especially for a generator with a large engine. You don’t want to be pull-starting it. Many come with electric starters, or even cell key fobs for remote starting. That’s a handy concept if you’re working construction and can remotely start the generator from the other side of the site. The safety features built into a generator are also a major issue. These machines can create powerful electrical currents capable of causing serious injury and even death. As with all other sources of electricity, these units simply cannot cut corners on safety. The design comes into play for small portable units favored by the grab-and-go crowd. These little guys are often lightweight and some even come with wheels. Larger systems also usually have handles and wheels, although heavy-duty industrial units sometimes just rest on skids and need to be moved by forklift, or at least a couple of burly guys. If you plan to use it in a camping setting, you might also need to be aware of the need for a spark arrestor in national parks and forests. You may also have to abide by noise limits. 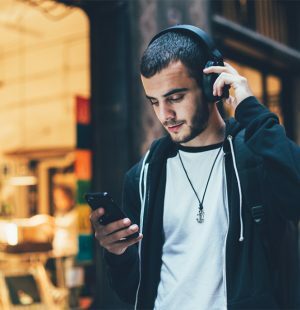 Finding a quiet machine might be one of your main concerns. There are hi-tech features available that could also appeal to you. Some features to look for include things like a display monitor, Sine Wave output gauge, voltmeter, ultra-quiet modes, engine systems like pressurized lubrication and even the warranty. These machines generate electric current in two ways. The most common variety is the ordinary generator system. The gas or diesel-powered engine runs at a constant speed of 3600 RPM for a standard 60Hz generator. This is necessary because the generator makes electricity by spinning magnets past each other at precisely this speed to create the 60-cycle per second Alternating Current (AC) demands of all of your home appliances. If the engine deviates from this speed, your lights will dim and many other appliances won’t work at all. It’s a sort of a brown-out effect. The downfall of this means that the engine must have an oversized capacity to make sure that when you switch on a plugged-in item, the engine is capable of maintaining its speed even though you have suddenly created a heavier load on the generator. This increased engine size adds to overall weight and fuel consumption numbers just to accommodate brief moments of peak demand. The alternative is to use a different kind of generator called an inverter. The inverter design uses a 3-phase alternator that first generates direct current (DC). Then an inverter converts this into AC. There are many advantages to this. First, it allows the engine to change its speed up and down to match the load demands. That means that at lower loads, the engine is running slower and therefore, quieter. It also uses less gas. Perhaps the greatest advantage is the quality of the electricity produced. An inverter provides consistent, clean electricity without any of the voltage irregularities that an ordinary generator makes. This is particularly important if you are powering sensitive electronic equipment like computers. The biggest downfall of inverter-style generators is cost. An inverter generator will generally have a significant increase in price when compared to a similar sized standard generator. What Type of Generator Suits You Most? The answer to that question depends entirely upon how you intend to use your generator. You may want a small generator that is lightweight and quiet to take along on camping trips or to stash in your RV. But that machine won’t do if you intend to use it for emergency power if service to your house is interrupted. You need to settle on a generator that has enough wattage capacity to power primary systems like a refrigerator, portable heaters, some lights and, of course, cell phone chargers. If you plan to use it on a construction site, where demands could be heavy, you need to look for maximum capacity. The noise generation isn’t as much of a factor here. You may also want to look for a diesel-powered unit since that fuel is usually readily available in these locations. Some of the added features might interest you. For example, the automatic starting engines are wonderful if you don’t want to be yanking on a starter rope. Just push a virtual button on a key fob or phone app and smile as your generator comes to life. The machine’s weight and design of the wheels and handles can also be portability factors. One final consideration is cost. Our Top 10 Best Generator List includes units with sale prices ranging from $266 all the way up to nearly $2,000. We created our generator review with practical testing data provided by a number of volunteers and consultation with experts in the field. Once we narrowed the choices down to 70 machines, we actually tested about 55 of them. Because there are so many variables involved, we can’t say that any one of these generators is flawless. We found at least minor faults with all of them. However, this process did lead us to a short list of what we feel are 10 top best generator selections. You will find a variety of sizes on our list because no single generator is going to be good for all purposes. But for the tasks that these individual generators were designed, we believe the products on our list represent the best available today. This process focused on main points like running wattage, surge wattage, engine displacement, fuel type and tank size, and safety and performance certifications. We evaluated the starting methods, the cooling systems, the weight and portability of a generator. We projected the longevity of each system and also included the warranty coverage in our evaluations. Naturally, since a generator can cost quite a lot, the sale price of each system was also a part of our deliberations. 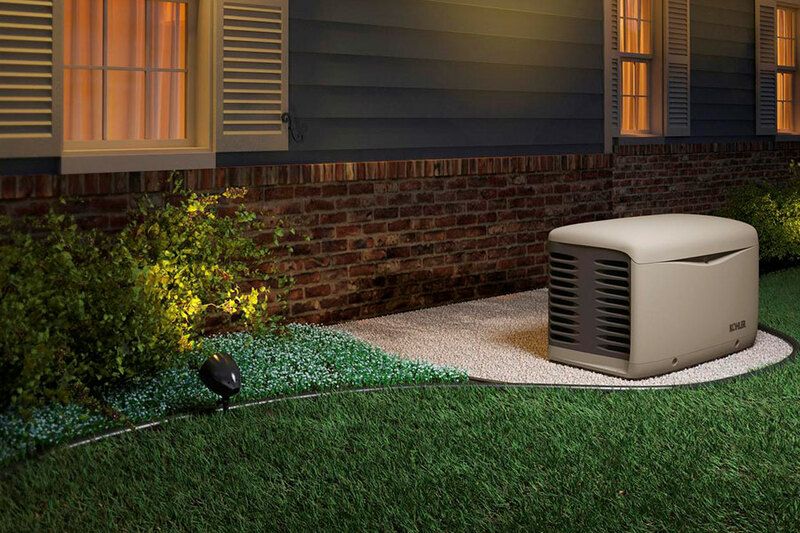 We have analyzed 44 of what we consider to be the most important features available on a top generator. Then we compiled all of this research into an in-depth report from which we developed our top ten generator review. But we don’t just give you our top ten. We’re giving you that entire research report so you can study the facts for yourself. You will find our research report attached below. We suggest you read our top ten best generator list first and then dig into all of the particulars included in our attached research report. This is the best place for you to be able to make direct comparisons between all of the generators we studied. This is the kind of generator that will power your home without fail. With long running times and a durable design, it’s something you need to keep in your home for any natural disaster. The name Westinghouse is synonymous with anything to do with electricity, so you know instantly that this is a trustworthy brand. But the nameplate doesn’t generate electricity, so there has to be more – a lot more – to make us rate this as our Best Pick. The ample wattage ratings, long run times, very reasonable price, and many features help this unit rise to the top of our list. We have analyzed 35 features for each of these generators. With 16 of those to its credit, this unit does not have the highest number of features, but it does have the most important of them. As you can see on our research report, the 3600 running wattage is generated by a 212 CC fan-cooled engine. With a 4-gallon gas tank, it has a half-load run time of 16 hours. That’s the best on our list. 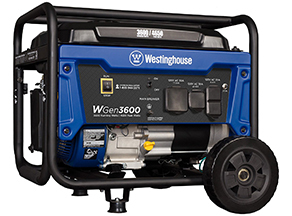 This Westinghouse generator is great for home or other outside uses. Online reviews agree. Part of our research is to study the rate at which these generators received positive reviews on Amazon. 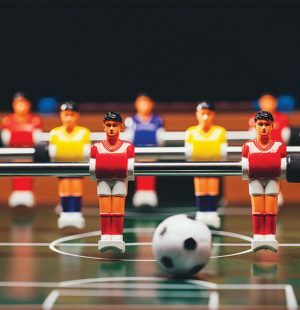 In simple terms, the frequency of positive reviews demonstrates how popular a product is with actual purchasers. The faster it gets good reviews, the more units are being sold and the happier the new owners are. We compared each of these generators for 30 recent reviews. We found this machine received its first ten positive ratings in just 16 days, its second ten in another 16 days, and its third set of ten ratings in 17 more days. That’s a lot of happy new owners. One thing we were most satisfied with about this generator is the premium materials from which it is made. The hardened steel frame and powerful engine with cast iron cylinder sleeves mean this is a machine with a nice price that you can count on to provide outstanding portable electric power for many years to come. This is a gas-powered, standard type generator. The 212 CC Westinghouse-branded engine is EPA, CARB, and CSA compliant. It has an added cooling fan and an automatic low oil shutdown feature to help protect the engine. Cast iron sleeves in the cylinders of this overhead cam engine mean it will have a very long lifespan. It is a recoil started engine, so be prepared to pull the starter cord. The hardened steel frame extends up and over the 4-gallon fuel tank, creating a sturdy roll cage around the entire machine. It’s running wattage of 3600 is higher than all of our top ten except for the professional and advanced choices. 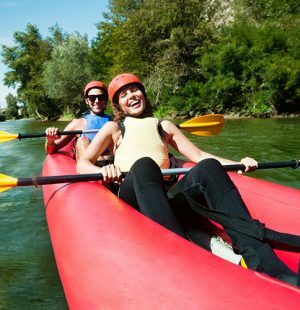 It’s more than ample for most outdoor or whole house emergency situations. Additionally, this generator can handle surge demands of up to 4650 watts. This machine has a half load run time of 16 hours and can run up to 18 hours at a 25% load before it needs refueling. The WGen3600 creates a fairly quiet noise level of just 69 decibels at a 50% load. That’s a good mark for a generator this large. There is a large master on/off switch that will stop the entire machine in a heartbeat. There is also a large toggle switch for the main breaker that can cut the flow of electricity without stopping the engine. Additionally, the 120-volt receptacles have a secondary 20 amp push-type circuit breaker. Another great safety feature is the independent rubber caps that snap securely over each power outlet. This way, if you’re not using a particular outlet, water, and other contaminants can’t get into the outlet and cause a short. In addition to the switches we’ve already mentioned, the control panel is prepped for just about any use you might find for this generator. There is a dual receptacle 120V 20 amp for household uses. There is also one RV-ready TT-30R 30 amp receptacle, and one L5-30R 30 amp outlet. The control panel is a simple layout that does not require a degree in electrical engineering to operate. This unit comes with a sturdy set of wheels and a well-designed fold-down handle that makes it very easy to pull around. It weighs 104 pounds, which is not bad for a generator as powerful as this one. The warranty is good for three years. Westinghouse also includes lifetime access to nationwide customer service and support by way of a toll-free phone number. There are a lot of reasons this Westinghouse generator tops our list of the best rated generators. It has a high output rating with long run times and a durable design that just won’t quit. 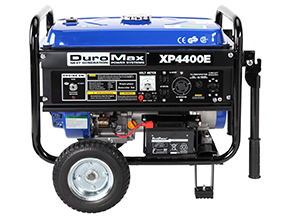 This is a generator that you can buy with confidence for just about any assignment. It is clearly a great choice for home usage as well as for on-site requirements. If a natural disaster strikes your home, this generator will easily provide enough backup power to keep your important systems running. It is powerful, quiet, and capable of running all night without attention. The well-designed steel frame and clever handle system make moving this machine around very easy. We do wish it had an electric start. That’s our only complaint. However, the amazingly low sale price of this unit explains why Westinghouse has equipped this unit with a recoil starter. For a cost of only about $400, this confidence-inspiring generator is a great deal. The power it generates at a very reasonable sale price can’t be beaten and explains why it is our top rated generator. For such a small generator, this product surprisingly offers a great supply of energy. Its convenient features like its long run times and low fuel consumption make this one that’s worth WAY MORE than what you paid for! 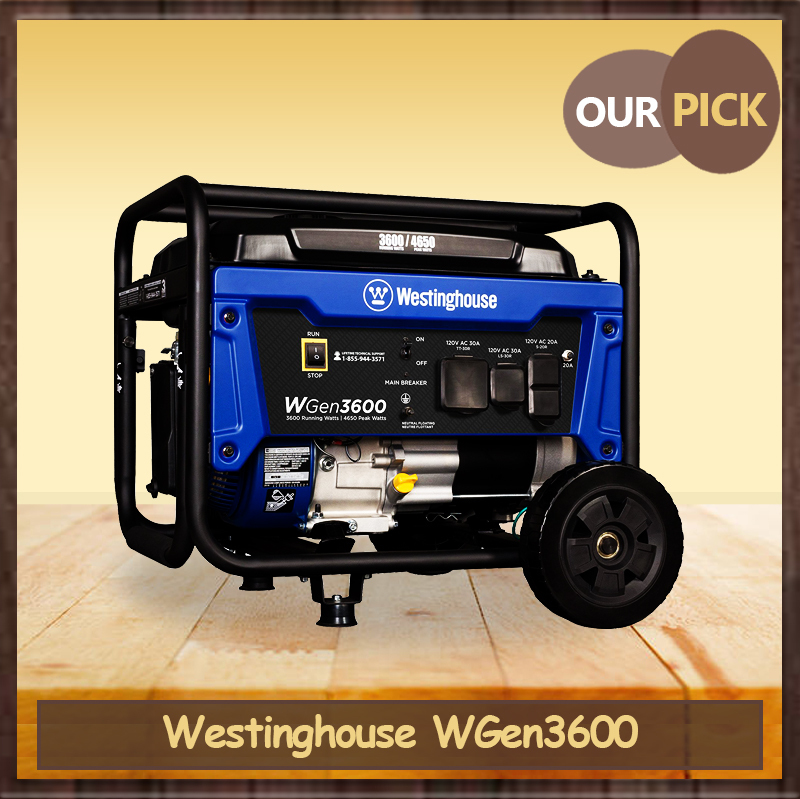 Price is the main reason this generator from trusted tool and equipment manufacturer Wen is our top budget pick. With a sale price of around $200, this is easily the lowest cost generator on our list. But don’t confuse a low sale price for low quality. Despite the relatively cheap price tag, this generator still has many positive features. Let’s begin with a 1500 running wattage capacity and a half load runtime of about 7 hours. Now consider that it only weighs 50 pounds, making it easily one of the most portable machines on our list. Owners are happy, too. Our sampling of online reviews shows that it received its first ten positive ratings in just 7 days, second ten in 16 days, and third set of ten in only 21 days. Despite the low price, this generator manages to deliver good power in a lightweight, space-saving design. Wen powers this little dynamo with a 98 CC engine that uses a recoil starter and has a fan for air cooling. It is EPA and CARB compliant. It does have an automatic low oil shutdown system. The generator is a standard type design. The engine and generator rest on rubber shock mounts inside a steel cage. The entire generator measures just 20 X 16 X 17 inches. The running wattage rating for this generator is 1500 watts, and it provides a surge wattage of 1800. That’s not huge, but it’s enough to power a few small appliances, and certainly more than enough for that camping trip. With a 1.45-gallon tank full of regular gas, you can expect a half load run time of 7.5 hours. This little powerhouse just sips fuel. At just 50 pounds, this machine packs a lot of power in a small design. Not the quietest machine, but it’s not so loud that you feel yourself working hard to talk over it. The muffler comes equipped with a spark arrestor, which means it is safe and permissible to use this machine in national parks and forests. The control panel has a large on/off switch that lights up when the engine is running. There are dual push-type circuit breakers for the two 120v 3-prong outlets that supply 12.5 amps of power. There is also a cigarette-lighter type outlet for 12v DC applications. There are no wheels or handles on this unit, but the lightweight construction and small size means that it’s fairly portable even without wheels. The only hefty element of this generator is the warranty. Wen gives it a nice two-year warranty. This is the smallest generator that Wen offers, but it supplies a respectable supply of electricity for such a tiny unit. With features like automatic low oil shutdown, very long run times, low fuel consumption, and a national park-safe spark arrestor, this little guy is perfect for camping or even light emergency duty at home. It will power your refrigerator for a couple of hours at a time, or the coffee pot to brew a new carafe full, but don’t try to run them both at the same time. All of that comes for a price of around $200! No wonder it’s our best budget pick. With digital controls, an electric starter, and other advanced features, this unit is one of the most high-end we’ve reviewed. It’s a bit expensive, but it’s worth the price! Choosing our advanced pick was made easy by this entry from Westinghouse. It is a feature-rich generator with enough power for whole house applications. For starters, it has a generous 7500 running wattage capacity powered by a massive 420 CC engine. Push button starting, a half load run time of 14 hours, a digital data center on the control panel, 2 GFCI outlets, and the ability to tie it into the electrical system in your house by way of a smart switch are all reasons this generator walks away with the title of the advanced pick. 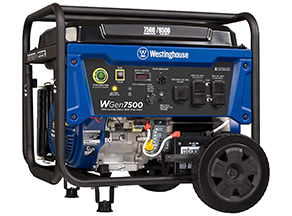 At about $800, the WGen7500 is among the more expensive of the best generators we tested, but there is a lot of value here. Online reviews from owners of this generator agree. It was rated positively by ten reviewers in just 16 days, a second ten in 10 days, and a third ten in 51 days. This serious generator is powered by a Westinghouse 420 CC OHV gas engine with a cast iron sleeve and automatic low oil shutoff circuitry. That’s a lot of engine designed to handle heavy loads for long periods of time without failure. It is EPA, CARB, and CSA compliant. It features an electric starter. The generator is a standard design unit. The frame is a hardened steel roll cage design that completely wraps around the entire generator, including the huge 6.6-gallon gas tank on top. A convenient stow-away handle and over-sized wheels make it easy to roll this machine. That’s a good thing because at 192 pounds, this is a heavy machine. This generator is rated at a whopping 7500 running watts and a surge rating of 9500 watts. That’s enough for whole house power during an emergency. In fact, that’s exactly one of the major design considerations of this unit. 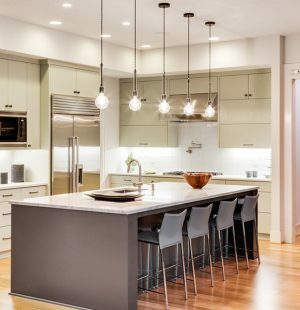 It is equipped with the ability to attach it directly into your home’s electrical circuitry by way of a smart switch. This allows you to safely power your entire house in an emergency. This is an excellent design feature. This generator has an impressive half load run time of 14 hours. This is a big, powerful machine. It does generate some noise. Using it in a campground won’t win you any friends among your fellow campers. But for heavy duty use on a construction site, or as an emergency generator at home, this isn’t much of a concern. The engine is well protected with its automatic low oil shut-off and just flat-out over built design. The control panel feature GFCI outlets for 120V AC, which is a great safety feature. It has a large dual-switch main breaker and separate push-type breakers for the 20 amp outlets. All outlets have rubber caps to seal them against inclement weather. The control panel on this generator is impressive. It has a large push button electric starter. The machine also comes with a key fob for remote starting. There is a battery indicator light to tell you if the onboard battery has a satisfactory charge. It also has its own onboard battery charger to help you keep that battery in good condition. There is a digital data center that provides accurate readouts for the voltage and frequency of the electricity being generated by the unit. You can also use this readout to determine the hours of usage being recorded by the engine, so you will know when to change the oil. There is one 120/240v 30-amp L14-30R outlet and four GFCI 120V outlets for safe and secure power connections. An additional outlet provides for attachment of a smart switch line that can be attached to the breaker box in your house. This generator is designed with whole house power backup in mind. The remote start key fob and transfer ready switching components really set this generator apart from the competition. The warranty has a three-year term, and Westinghouse also supplies a lifetime nationwide service network reachable by a toll-free phone number. One note about the smart switch option. This is a breaker-box looking device installed in your home that allows the generator to safely take control of supplying power to your entire home, without fear that electricity is being sent back through the normal power lines. That’s a condition that can be very hazardous not only for you but also for crews working to restore power in your neighborhood. The box must be installed by a licensed electrician. This is probably the best generator for home use that money can buy, but it does have a steep price tag. It has many advanced features, like remote starting, extended run times, high power output and the ability to tie it into your house’s breaker box by way of a smart switch. The digital readout center lets you keep an accurate eye on the quality of the power being generated by the system, and the hours being logged by the engine. If you can afford the $800 price tag, you won’t be disappointed. Heavy-duty has never been this great. With a whopping 10000W power, this portable generator can power an entire house. A great choice for commercial spaces, or if you want a highly-powered home! This is simply the biggest, baddest generator in our top ten list of best generators. It is an excellent system for professional use on construction sites and the like. It has the greatest durability and highest power output of anything we tested. The 680 CC V-Twin powerplant churns out a whopping 10,000 running watts of power. That engine is protected by a pressurized oil system and shock-mounted oil cooler for extended run times. At a hefty price tag of nearly $2000, this is a professional grade machine beyond what most homeowners need. But for heavy-duty applications, this generator rises above the competition. 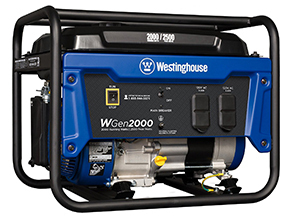 With an 11-hour half load running time and unique features like a Sine Wave output and smart idle control, the Westinghouse 10K PRO lives up to its name. For such a high-end generator, this one gathered positive online reviews at an amazing rate. It received the first ten ratings in just 16 days, the second ten in 20 days and the third ten ratings in just 21 days. The V-Twin engine has a 680 CC displacement generated in cast iron sleeved cylinders rated at 16.7 horsepower. Nothing else in our survey comes close to the massive power of this engine. It has a pressurized oil system, low oil shutdown, an external oil cooler, and forged pistons and components. This is a high-power engine designed to run for years on end. It is CARB and EPA compliant. It has an electric start engine as well as a remote starter key fob. It also utilizes a smart idle technology that allows the engine to slow to an idle when no power is being used. The generator has a standard design that emits less than 5% harmonic distortion and has automatic voltage regulation, which means it provides clean power for sensitive tools and electronics, like computers. The frame is a hardened steel roll cage design that envelops the entire generator. It has a handy fold-down handle and large wheels. The 10,000 running watts and 12,500 peak wattage are enormous. This generator can hold its own on any construction site and is a very capable back-up generator for whole house usage. The 9.2 gallon gas tank has a fuel gauge and gives this generator an 11 hour runtime at half load. This unit generates 74db of noise at operational levels. That’s not real quiet, but the beefy nature of this machine explains why. The best safety feature on this generator is the GCFI protected control panel. This makes the unit both CARB and OSHA compliant. All outlets come with rubber covers to keep them free of moisture and debris in even the harshest locations. Another nice feature is the quick draining fuel system, which allows for emptying the fuel tank prior to storage without having to remove any clamps or clips. The entire tank can be drained in seconds. The data center on the control panel provides the voltage and frequency being generated by the system and also measure the engine hours. There is a starter switch, a Sine Wave indicator, a main-breaker toggle switch and every circuit has its own push-type breaker as well. It is a true control center in every respect. There are 4 120v, 12 amp outlets, a 120/240v 50-amp outlet, a 120v 30-amp outlet, and a 120/240v 30-amp outlet to provide electricity in virtually any configuration you might need. This generator comes with a lifting hook, so you can use a fork lift or loader to move it on and off a work truck. That’s a good thing, because at 310 pounds, you don’t want to lift this one by hand. The warranty is 2 years for residential use and one year in commercial usage. If “more power” is your operating mantra, this is your best generator choice. A huge v-twin engine and a 10,000 watt generator certainly fit the bill. A bit much (and a bit expensive) for most home settings, this machine really aims at the commercial crowd, and scores a bulls-eye. Though it can’t power the entire house, it certainly can offer plenty of electricity to keep your RV and other small appliances running. It’s a low-cost choice that’s best for starters. Stuffoholics is calling this unit our “starter” generator, but there’s no reason it can’t be your portable power supply for many years to come. With features like remote start and a cold weather starting function built right into the 196 CC engine, you’re going to like this generator. It churns out 3500 running watts, and at about $400 is one of the most inexpensive generators on our best home generator list. Owners like it, too. This generator gathered its first ten positive reviews in 60 days, the second ten in 28 days, and the third ten in 56 days. The Champion engine has a 196 CC displacement for loads of power. It has a battery starter that can be triggered from as far as 80 feet away with the included key fob starter switch. It will work even in cold weather because of the cold start technology Champion has equipped the engine with. The engine has automatic low oil shutdown and a cast iron cylinder sleeve to improve engine life. It is EPA and CARB compliant. The generator is a standard type, but with a bonus. The generator includes a surge protector to guard against power spikes that could damage sensitive electronics. This generator is rated at 3500 running watts and 4000 peak watts. That’s not enough to provide backup power for a whole house, but it’s plenty to keep your RV happily humming away. It has an excellent half load run time of 12 hours on a 3.8 gallon tank of regular gas. Expect a noise level of 68 db from a distance of 23 feet. That’s reasonably quiet. The built-in surge protector is a great safety feature – not so much for the generator as for the appliances you plug into it. It does not have any rubber covers for unused outlets on the control panel. That’s a feature we have seen on many of the best generators, and something we think should be on all of them. The control panel is equipped with a digital readout that can be switched from the voltage output to the frequency and also the hours of run time being tallied by the engine. This is a nice feature usually only available on more expensive machines. There are 2 standard 120v 20 amp outlets, a locking 120v 30amp outlet, and an RV ready 120V 30amp TT-30R outlet. Push-type breakers keep the circuits safe. One thing missing on this machine is a master circuit breaker. This is a safety feature we think all generators should have. It has a single fold-away handle and wheels. The warranty is good for three years and also has free lifetime technical support from Champion. You will buy this generator to power your RV, and then discover it has many uses beyond that. It’s a functional, if not overly powerful, backup generator for home use. It is one of the lowest priced units in our top ten rated generators, and that may be one of its strongest selling points. But don’t overlook the remote starter and volt guard technology. It’s ideal for RV use. Going on camping? This Honda portable generator can power your campsite with 1600W. Operating quietly, it’s perfect if you want to enjoy the peace and quiet of the great outdoors. A must-have for the outdoorsy types. Sometimes the best things come in the smallest packages. 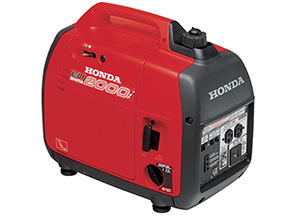 This little Honda is the first inverter generator to make our list. Despite its over-sized lunchbox design, it generates 1600 running watts of power and is so quiet you may think it has stopped running. It’s not cheap, though. Because of the advanced inverter design, it carries a hefty price tag in the $1000 neighborhood. Despite the cost, this generator received its first ten positive reviews during our test period in 95 days, second ten in 68 days, and the third set of ten reviews in 67 days. The 98.5 CC engine combines with an inverter style power generator to crank out 1600 running watts of power and a surge wattage of 2000. The entire system is encased in a little red box with a handle on top that measures 20.1 X 11.4 X 16.7 inches and weighs less than 46 pounds. It is a recoil starter, but this little engine is an easy starter. That 1600 watts is enough to power your campsite our outdoor event with ease. It will run for more than eight hours on the one gallon of gas it can hold. This generator is super quiet. It’s still a generator, so there is some exhaust noise, but when compared to other generators, this one is king of quiet. The entire system is encased. There are no external moving parts and very little opportunity for anything to go wrong. There are some interesting things on the control panel. First is the eco-switch, which allows the generator to run at a lower speed when the load is light. Remember, this is an inverter generator, so the engine doesn’t have to run at 3600 RPM to create 120 volt, 60 cycle power. The two 120V AC outlets are protected by a 13.3 amp push-pull circuit breaker. It also has an 8 amp 12 volt DC outlet for battery charging. There are also parallel operation outlets. That means you can link two of these generators together to double the power output. That’s an very beneficial feature. The control panel also has warning lights for an oil alert, an overload alarm and an output indicator. The cables for that parallel operation are an extra purchase item that sell for around $50. The warranty is three years. There is a lot of cutting edge technology in this little package from Honda. The inverter generator provides stable, clean power. The quiet operation is one of the best on the market. The small size means you can put it in the trunk of the car or stow it in your RV and take it anywhere. The drawbacks are a high price tag due to the inverter technology and a fairly low power output. Still, if you don’t need a lot of power for the task at hand, this generator is worth a good look. If you just want a generator that can power up some basic necessities, then this was made for you. 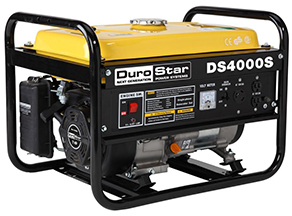 Durably built, the Durostar runs on 3300W and can run for around 8 hours. A reliable choice. This entry from DuroStar is a capable, if somewhat stripped-down version of a basic generator. But with a price under $270, this generator has reason to be somewhat barebones in design. If your generator needs only call for basic backup power or modest duty on remote sites, this machine might warrant your examination. The 230 CC DuoStar-branded engine is rated at 7 horsepower. There is no electric start on this machine, so be prepared to pull the recoil starter. It does have a low oil shutoff capability. It is EPA approved, but does not meet CARB requirements. The generator is a standard-type. Both the engine and generator are mounted on rubber isolation pads to reduce noise and vibration. The frame is a steel wrap-around design. One obvious flaw is the lack of wheels. This generator is just a little too big for one person to comfortably carry it around. That means moving it requires either two people, or the purchase of an optional wheel and handle kit. In other words, DuroStar practically forces you to spend another $50 to purchase these “accessory” parts that are really quite necessary for most applications. There goes the economy sales point. 3300 running watts and a surge rating of 4000 watts is on the lower side for a generator of this size, but still a respectable output. The fairly small 4 gallon gas tank means this machine only has an 8 hour half load run time. However, there is a fuel gauge built in to the top of the tank, so you can easily keep tabs on your supply of gas. The muffler, which also has a spark arrestor, does a fairly good job of quieting this machine. It produces a noise level of 69 decibels. That’s very good but could be better when you consider the relatively low power output of this generator. This is a budget entry from DuroStar so there are no stand-out safety features on this model. Still, the overall design of this generator meets the minimum safety expectations. The engine switch is large and easily accessible in an emergency. It is paired with an oil alert lamp and an analog volt meter to help you make sure everything is running properly. There is a single toggle-style main breaker switch. However, there are not separate breakers on the individual power outlets, like many of the higher priced generators have. It has 2 120v AC 3-prong outlets and one 120V AC 30 amp twist-type outlet. As we previously mentioned, an optional wheel and handle kit is available for a bit more than fifty bucks. You’re going to have to spend this, unless you like dragging a 90 pound machine around. The warranty is a skimpy one-year in duration. Stuffoholics recognizes that this is a bargain grade entry in the search for top rated generators, so we don’t expect a load of amazing features. However, the fairly low rating of 3300 running watts, basic control panel, short half load running time, and the necessity for purchasing a wheel and handle kit as an optional buy leave us a bit cold. It is a capable generator – it wouldn’t be on our list if it wasn’t – but we’re not sure this is the choice we would make. A well-designed generator from DuroMax claims the eighth spot in our list of top rated generators. It is a sturdy, capable generator with a mid-range power output in a nicely-priced unit. It features electric start and a couple of other nice points. It’s worth a look. The engine is a 230 CC OHV model that cranks out 7 horsepower and is equipped with an electric starter that actually uses a removable key. It has an engine fan for cooling the powerplant and automatic low oil shutdown. It is EPA and CARB compliant. The generator is a standard-type design. The frame is a tube steel wrap-around design that employs sturdy metal-rimmed wheels with solid rubber tires, and a pair of fold-down handles. The gas tank holds 4 gallons. This generator puts out a very respectable 3500 running watts and a surge level of 4400 watts. That’s an ample supply for site work or emergency use in a home. The four-gallon gas tank limits its half load running time to eight hours, but the tank is equipped with an easily readable gas gauge. The 69 db noise level emitted by this generator is a very good mark for a system that puts out 3500 running watts. It is an overall safe design for a generator. We do wish that it included rubber caps to seal the outlets from the elements when they are not in use. There are some good features on the control panel. The removable key for the electric starter is a nice touch that keeps unwanted users from starting the machine. It has an analog voltmeter, dual breaker main circuit breaker switch and a 120v/240v switch for choosing the voltage you wish to output. Outlets on the control panel include two standard 3-prong 120v 20 amp outlets and a 120v/240v twist lock outlet. Those are nice options. 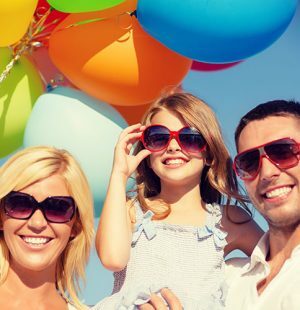 The warranty is only one-year coverage, which we don’t find satisfactory. This is a capable standard generator. It puts out a respectable 3500 running watts and has some agreeable features like electric start with a removable key. This generator is a good choice for work site or backup power generation. This generator is perfect for family road trips in an RV. Although it’s a bit expensive, it redeems itself for its safety features and well-designed digital panels. It also features advanced Inverter tech! Stuffoholics likes this fully enclosed model from Champion. It generates a lot of clean power by way of an inverter design that is great for camping or RV, neighborhood picnics, or other outings where children may come in close proximity to the machine. It has a 171 CC engine that has a low oil shut-off sensor. It has a recoil starter and cold start technology to help you get it running in colder weather. It is EPA and CARB compliant. The generator is an inverter type, so you know you will be getting clean power to safeguard your more sensitive electronics. The inverter system also allows the engine to run in an economy mode, which increases run time and decreases noise levels when the load is not high. The machine is encased in a plastic shell, for a clean appearance. It has a U-shaped handle that folds down, an extra handle for lifting on each end, and cute little wheels. 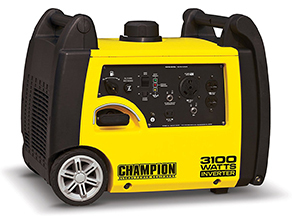 This generator is rated at 2800 running watts with a starting output of 3100 watts. That’s enough to comfortably power outdoor party needs as well as most RV’s. The fuel tank holds 1.8 gallons of gasoline and gives it a running time of 8 hours at a quarter load. This generator emits a quiet 58 dB of noise at 23 feet. The enclosed design makes this machine inherently safe around children and groups of people. It is also a good design for use with an RV. The panel features a fuel cutoff lever and choke lever right above the recoil starter handle. There is also an engine on/off switch and a switch for economy mode. Three LED lights inform the status of power output, engine loading, and low oil. There are two 120v outlets and an RV ready socket as well. Because this is an inverter generator, it also has a 12 volt DC outlet. The AC and DC circuits each have a push-type circuit breaker. Champion supplies a three-year limited warranty and offers free lifetime technical support. This generator is truly designed for portability, and it answers the call very well. The inverter generator offers clean AC power, as well as the direct current choice for charging batteries and other DC uses. At about $800, it’s not a cheap unit. But Stuffoholics appreciates the technology of inverter generators and thinks they are worth the money. Using inverter technology, this portable generator generates a clean power supply for all of your devices. Affordable, VERY quiet, reliable and versatile, this is a great Wen purchase. It works great as your “first generator” too! This little powerhouse from Wen fills out our top 10 best generator list in style. It is super quiet, very portable and uses inverter technology to provide clean power. Best of all, the price of about $475 is by far the lowest cost inverter system on our best gas generator list. 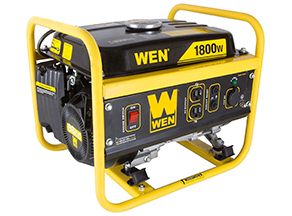 This Wen generator is powered by a 79.7 CC OHV engine that is fully encased in the lunchbox-style housing. There is a low oil shutdown system on this engine. It meets EPA and CARB standards. The generator is an inverter type, which means it provides very clean, nearly perfect sine wave electricity that makes all of your sensitive electronic devices very happy. The housing is a heavy-duty tough plastic design that keeps all of the moving parts safely tucked inside. It does not have wheels, but at only 48 pounds and 11 x 18 x 18 inches, it’s easy to carry. The running wattage is an impressive 1600 watts with a surge watt rating of 2000. The fuel tank holds one gallon. This little powerhouse has a half load run time of 6 hours, which is very impressive. This generator is the quietest machine in our Top 10 Best Generator List. At 51 decibels at a quarter load, it’s about the same volume as a normal conversation. Put it on the backside of your RV or tent, and you won’t even hear it running. Since the entire machine is enclosed in a hard outer shell, this is a very safe design. Because of the spark arrestor on the exhaust, it is also safe for use in national parks. The entire control panel is on one end, opposite from the air intake and exhaust. It has a single knob to control the choke and engine on/off modes. There are LED’s to indicate electrical output, overload, and engine oil. A central switch lets you flip this inverter system into eco-mode, which allows the engine to adjust its RPM to match the demands of the load. If you’re not asking much from it, the engine slows way down to conserve fuel and generate even less sound. It has two 120v 3-prong AC outlets, a 12v-DC outlet and even a 5v USB port for charging phones, tablets, and laptops. Wen also equips this generator with parallel operation outlets, which means you can hook two of these generators together for a dual system that will generate 3600 running watts. That dual generator kit from Wen (Model 56421) sells for about $64 dollars. Connecting two of these 56200i generators together with this kit is capable of supplying power for an entire RV. 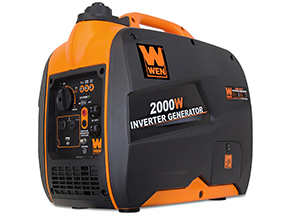 Wen sells this inverter generator with a 2-year warranty. Wen has a winner on its hands with this generator. The inverter technology gives you a clean power supply for even the pickiest electronics, and it does it at an amazingly low price for an inverter. The ability to parallel two of these units together means that for about a thousand bucks you have an inverter generator system capable of 3200 running watts with a surge rating of 4000 watts. Then, you can also split them up and supply power in two places at once. That’s a pretty versatile option. This machine is a great buy. In an ideal world, all you would have to do with a generator when you are finished with it is turn it off and stash it in the corner of your shed. We don’t live in that world. Because generators tend to be used infrequently – and we are usually dealing with some natural disaster or other problem at the time – they do require some care when you are finished using them. Begin with a routine inspection and cleaning. Make sure all fasteners are secure, dirt is wiped away, and all switches and outlets are in good condition. Change the engine oil if it is time to do so. This isn’t something you want to have to do when you are pulling the generator out to use in an emergency situation. If the machine has a fan, oil cooler, or other cooling systems, be sure it is clean and free of debris. One of the biggest hazards to gas generator longevity is leaving untreated fuel to languish in the fuel tank. Over time it loses its potency, becomes gummy, and can ruin tiny carburetor needles and ports. If you are going to store the generator with a load of fuel in it, be sure to add a gas stabilizer of your choice. An even better suggestion is to drain that fuel out and use it up in your lawnmower or other gas-driven machines. When you need the generator, give it fresh gas and it will run for many years. Even when not in use, a generator should be run periodically. This circulates oil, keeps the carburetor clean, prevents metal-to-metal contacts from seizing, recharges the starter battery, and provides you with peace of mind from knowing that your emergency backup generator is ready to go when you need it. Having a good supply of dependable electricity has become a necessity in modern life. Virtually everything we do relies on it. That’s never more apparent to us than when a natural disaster strikes, or we find ourselves miles from the nearest outlet. At times like these, we would give anything to have a portable gas generator at the ready. A better idea is to make sure you have your generator purchased and ready to go long before that moment of panic sets in. This Stuffoholics Top 10 Best gas Generator list and our attached research report provide you with a wealth of knowledge that you can use to decide which of these generators is best for your needs. Get one now, before it’s too late.